How to crochet beautiful cord bracelets! Make a slip knot, chain 3, insert the hook into the 2nd chain, yarn over and pull through a loop (2 loops on your hook), insert the hook into the 3rd chain, yarn over and pull through a loop (3 loops on your hook). *Remove 2 loops from hook, chain 1, insert the hook into the 1st removed loop, yarn over and pull through a loop (2 loops on your hook), insert the hook into the 2nd removed loop, yarn over and pull through a loop (3 loops on your hook)* repeat from * to * until you have he size you want. In the end, yarn over and pull through all (3) loops, cut the yarn and finish off. Put some glue into the clasp, insert the bracelet's end into it and hold it until dry, do the same to the other side. 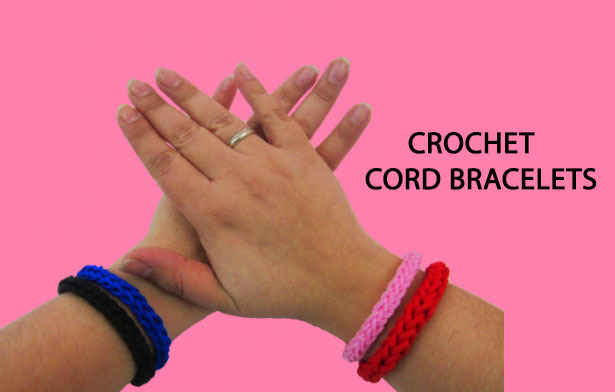 Watch my free video tutorial witch shows you how to make this lovely and easy cord bracelets!! !